In a day when there are hundreds of products containing so many mystery ingredients, each with their own individual marketing purpose, popping up in the beauty section of drug stores, it’s been so exciting to discover that caring for my skin can be a simple, natural, and luxurious process. Today, I’m excited to chat about one more natural and simple bodycare product: cleansing grains. A while back, one of my favorite green beauty Instagrammers, Gurl Gone Green, shared a picture on Instagram of cleansing grains. 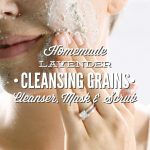 The idea of a cleansing grain intrigued me, which then led me on an exciting journey of learning about another option for natural skin cleansing. 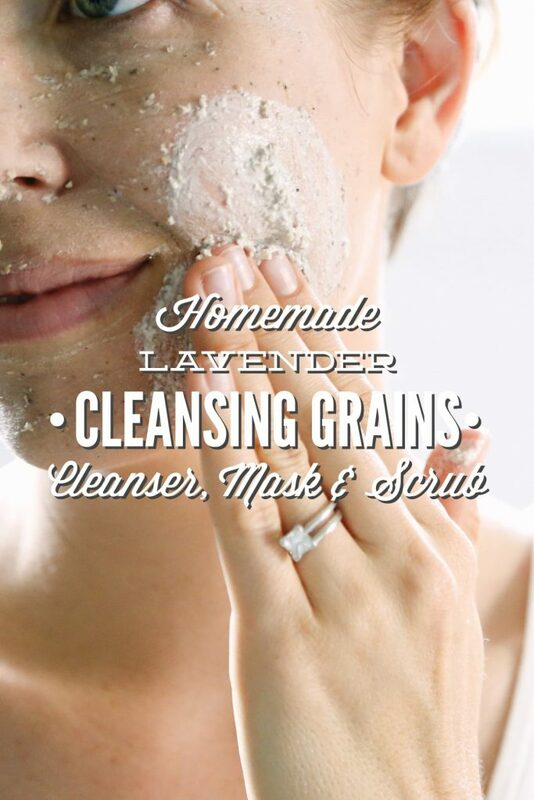 Cleansing grains are a powdered face cleanser/wash and gentle exfoliator. The grains are typically made from a few simple ingredients, such as: herbs, oats, nuts, and clay. The ingredients of choice are blended together to create a grainy powder. This powder may be combined with milk, water, aloe, or even a liquid face wash to cleanse and gently exfoliate the skin. Sounds a lot like a facial scrub, right?! Well, the beauty of this scrub-like product is that it’s gentle enough to use daily, and it may even be used as a daily facial cleanser/wash after removing makeup. As a young woman, I was taught, via commercials and beauty magazines, that I needed a soapy face wash to properly clean my face. Over the past few years, as I look for “more natural” cleaning and bodycare options, I’ve learned that a soapy face wash isn’t the only option for facial cleansing. Yes, you can make a simple face wash with gentle and natural ingredients, but there are also other options which aren’t talked about very much in the modern-age of industrial beauty products, like: honey and aloe vera, and cleansing grains. 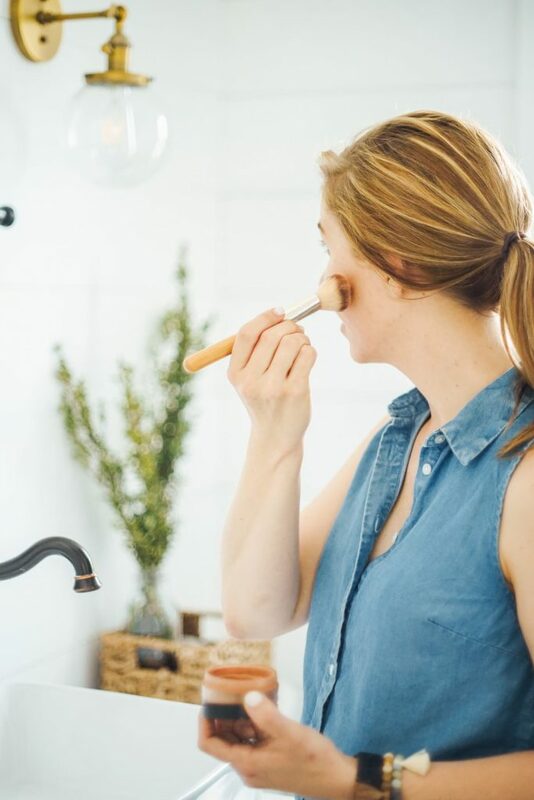 PS: While cleansing grains may not be talked about as much as a bottle of face wash, there are a number of expensive beauty brands that sell cleansing grains (try $44 for a .99oz bottle–yikes!). See, cleansing grains are 100% real ;). 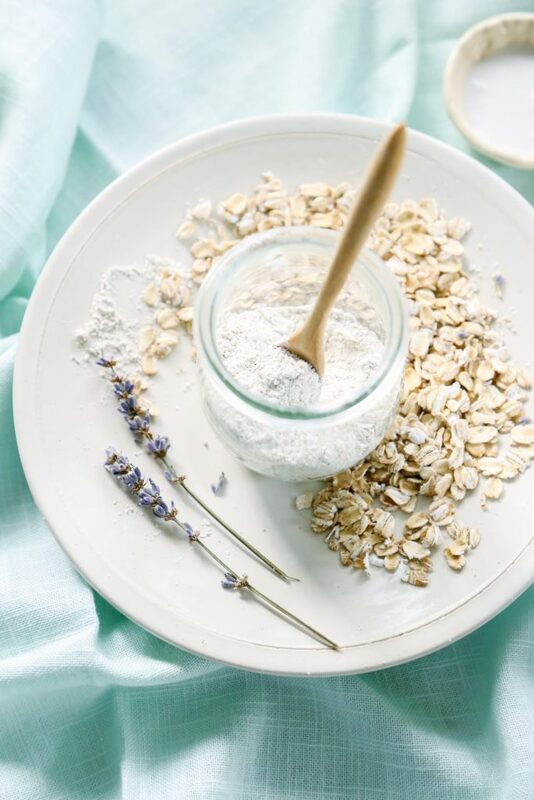 If you want a gentle and relaxing facial mask, combine 2 teaspoons of grains with 2 teaspoons of coconut milk (or another gentle liquid–see recipe). Apply the mask to the face, allow it to rest, and then rinse it off with warm water. This mask has been gentle enough to use on my sensitive skin multiple times in a week (just like my soothing facial mask). There are so many possibilities for customizing this mask according to your needs: add a bit of honey to the mask before applying, and/or add a drop of a skin-friendly essential oil. The cleansing grains may be used as a daily cleanser. I’m still obsessed with my honey and aloe facial cleanser, and it continues to be my go-to daily face wash with my Clarisonic Mia. I took a break from that cleanser to try out the grains. 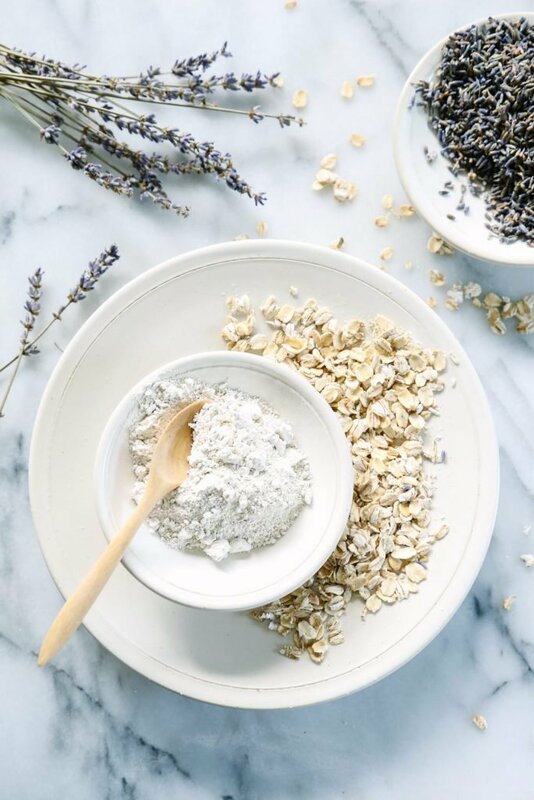 I’ll admit, I was a bit skeptical of the idea of using clay, oats, and lavender as a daily facial cleanser, just like I was skeptical of using honey and aloe. I really enjoyed using the grains as a facial cleanser–my skin felt clean, refreshed, and smooth each night after using the grains. I did use a makeup remover before applying the grains, and I would recommend this step for anyone wanting to use cleansing grains as a daily cleanser. To make a facial cleanser, combine 1 teaspoon of cleansing grains and 1 teaspoon of coconut milk (or another gentle liquid–see recipe). I recommend using the grains at night before bed, and just washing your face with water in the morning. If you’re looking for a sugar-free scrub that’s super gentle, look no further than cleansing grains. To make a scrub, combine 1 teaspoon of cleaning grains and 1 teaspoon of coconut milk (or another gentle liquid–see recipe). Then apply the scrub to the face, massage the skin with the scrub, and rinse it off with warm water. This scrub may be used as an occasional skin treat, or as a regular facial scrub, if you’re not using the grains for daily cleansing. Before sharing the recipe, let’s talk about one more thing: the holidays. It’s only October 1st, but I know many of us are probably starting to think about Christmas gifts, teacher gifts, and the perfect hostess gift. Come December, I’m going to make a big batch of cleansing grains for all the ladies in my life, package the grains in mason jars, and then wrap the jars with a can of coconut milk–along with instructions. What a cute, fun, and practical gift! And what a great way to introduce my friends and family to natural bodycare products. 1/4 cup old-fashioned rolled oats Don’t use steel cut oats. 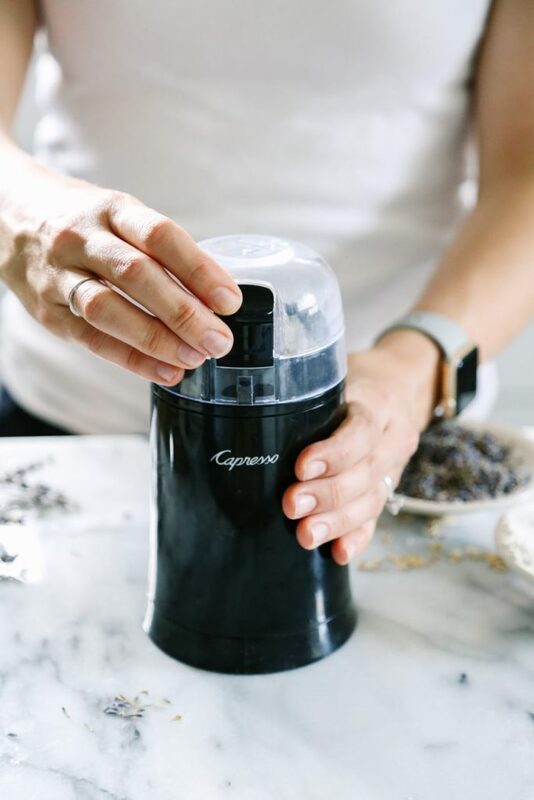 Combine the oats, lavender, and clay in a spice/coffee grinder and blend for 45 seconds, in 15 second intervals. When you’re done, leave the lid on your spice/coffee grinder for a minute to allow the dust to settle. Empty the grains into a clean jar for long-term storage. To use the grains as a face mask, combine 1-2 teaspoons of the grains with 1-2 teaspoons of canned coconut milk, and (optional) essential oil. Apply the mask to the face, and leave it on for 5-10 minutes before rinsing it off with warm water. To use the grains as a daily cleanser or a scrub, combine 1 teaspoon of the grains with 1 teaspoon of canned coconut milk. Add (optional) the essential oil. Massage the face with upward, circular motions, then rinse the grains off with warm water and a washcloth. Follow-up with a toner and/or moisturizer. Kaolin clay is a very common clay used in cleansing grains. It’s considered a versatile cosmetic clay that is suitable for all skin types. 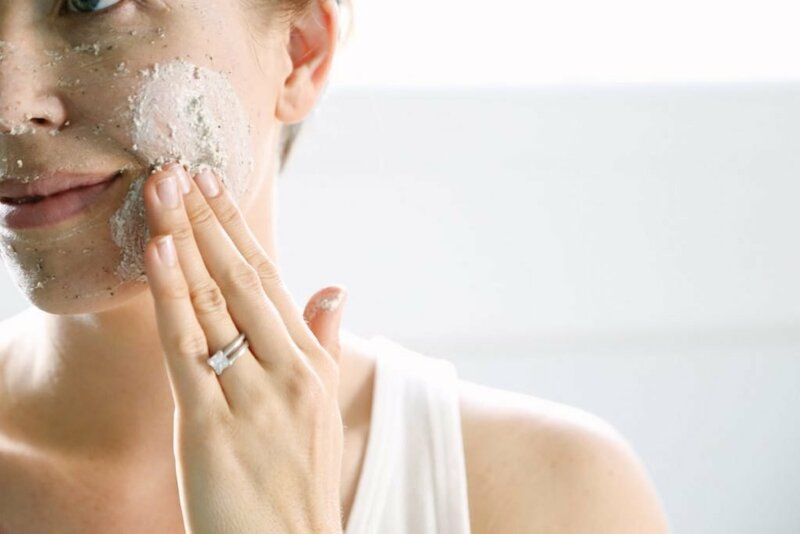 If you don’t want to use Kaolin clay, you may also try: bentonite clay (very detoxifying–so it may be too much as a daily cleanser), French green clay, or rhassoul clay. I keep a small mason jar of coconut milk in my fridge for culinary use–using it within a couple of weeks, although the can says about a week. I’ve been using a small amount of the coconut milk to mix with the grains. If you don’t have any coconut milk available, try water, aloe vera gel or juice, or even mix it with a gentle cleaner (like my honey and aloe cleanser). The goal is to create a soft paste that’s easy to spread on the skin. You can definitely double or triple the amounts called for to make the cleansing grains. The grains are a shelf-stable product. For a description about each use–cleanser, scrub, and mask–see the written post above. Love this recipe! Love the use of aloe vera! Thanks, Bridget. Enjoy the grains. Hey Sheila, This is a really gentle exfoliation. I don’t think you’ll have an issue if the powder is finely ground. can you premix a small amount to use as a daily scrub so your not mixing each day? Hey Marlena, I think so. I wouldn’t let it sit any longer than a few days, or a week. I think the clay may absorb the liquid and dry out the mixture. You may need a bit more liquid. Aloe vera gel may work better than water, too. Hello! !I really enjoy reading all the recipes for your website.Aboutone,can I use bentonite clay? Hey Dora, Thank you! Yes, you can :). Wow, thanks Kristin for the mention! How am I just now seeing this?! You’re so sweet! I have been using this every night and my skin is glowing. I had a large tub of bentonite clay so I’m using that with excellent results. Since a can of coconut milk will only last a week in the fridge, I freeze it in my mini ice cube tray. I put the little frozen coconut balls in a baggie and take one out of freezer about an hour before I want to wash my face to melt. BONUS: This works great as an underarm cleanser too. Gets rid of razor burn and the red itchy bumps from using baking soda deodorant!!! That’s so awesome, Moe! I love that you found it works for razor burn and bumps, too–amazing! what is the difference between this recipe and your two-ingredient-exfoliator-scrub? They are for the same use? Do you still do both or just one? Also, can I use normal milk to replace coconut milk in this recipe? Thanks for your kind sharing..
Hey Marina, I just use the two ingredient scrub. This is a great scrub, too, and just another option if you’re looking for something very soothing that can also double as a cleaner or mask. You could use normal milk. I’d like to substitute Bentonite Clay for the Kaolin clay – but then it dawned on me that my spice grinder is metal – which deactivates the Bentonite clay. 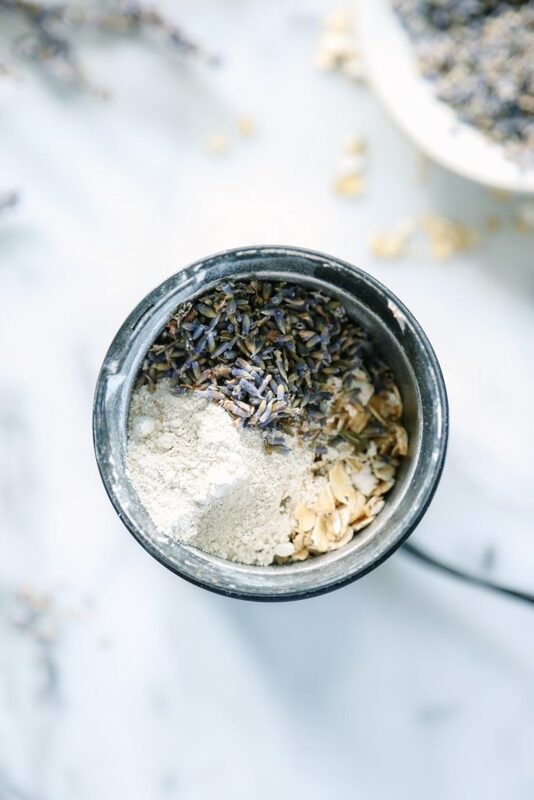 Should I just grind the lavender and oats and add the Bentonite after – or is it important to get the clay mixed in using a grinder? Hey Noel, Yes, that’s exactly right :). 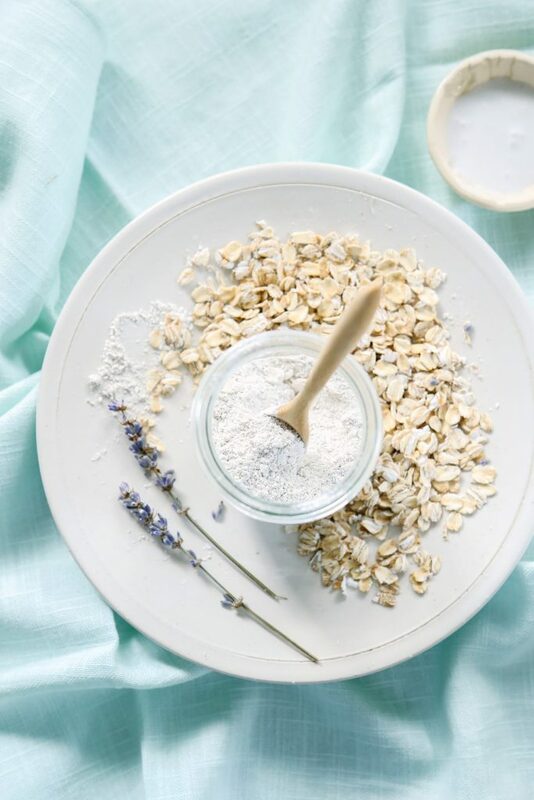 Just grind the oats and lavender, then add the clay later (to a bowl or storage container). Would it be too much to use almond meal or ground almonds instead of the oats? I’ve run out of oats and won’t be able to buy any for a while! Hey Qudsiyah Remtulla, You could definitely do that.